My Kuala Lumpur trip was a roller coaster ride –evenings I would be traipsing with the Bollywood stars but by day I would be an explorer. I would don my explorer’s hat (invisible to the eye), sling my camera around my neck and say HOHO! Yes, my mode of travel would be the HOHO bus – or as it is known in full – the Hop On Hop Off tourist bus. One of my ‘hop off’ destinations was the beautiful Kuala Lumpur Butterfly Park. It is located in the picturesque Lake Gardens area, touted to be the lungs of the city, owing to its lush green cover. It took me a minute to figure out the way to the park since most of the signage there pointed to the more famous bird park in the same area. I did see a board saying Taman Rama-Rama but I had no idea that it meant the butterfly park. A few minutes’ walk and I found myself at the gate of the park. A funny thing happened at the ticket counter. The entrance fee for foreigners were higher at 22 RM (I think) and as I handed out the amount to the person at the counter she looked quite surprised. “You not Malaysian?” she asked, sounding a bit perplexed. I shook my head, as confused as she was, and said I was Indian. Then it sunk in that my north-eastern look had confounded her into thinking that I was a local Malaysian. Ah well. I pushed the door to the butterfly park, an enclosed area, and the next instant I was transported to a different world. The first thought that came to my mind as I stood there was – Narnia. The second was – Alice in Wonderland. The photographs cannot express the wonder and beauty of this place. For, there were butterflies and more butterflies fluttering around everywhere, without a care in the world. There they were, sipping nectar from a bunch of blood red hibiscus flowers, laid out on a platform. I gazed unblinkingly in awe as the delicate wings flapped gently – open and shut, as if in contentment. One of the visitors, a girl, tried to dab her finger with the sweet nectar (sugar syrup?) so as to entice the butterflies to sit on her palm. I don’t know if it’s allowed or not, to disturb the feeding sessions of the butterflies like that. She kept on trying and the butterflies kept on ignoring her outstretched palm. Finally, she gave up, frustrated with her failed efforts. She then looked at me, startled. Unbeknownst to me, two butterflies had settled on me, one on my shoulder and the other on my arm. I gave a saint-like smile and moved on. Later, I noticed that many people were trying that trick of dabbing the syrup on their fingers to get that coveted picture of a butterfly on their fingertips. Perhaps that was allowed, after all. One particular lady, an Indian, almost crushed a butterfly as she grasped it whole to put it on her wrist. My heart skipped a beat, horrified at that. The park resembled a rainforest with a number of water features. Also, the weather was extremely humid, the sky laden with heavy, dark clouds. I would hear ominous rumbles of the gathering clouds and wondered what to do if it started raining. I was sweating like mad by then, telling myself that rainforests are supposed to make you feel like that. I roamed around aimlessly, marveling at the butterflies and the ornamental waterfalls. There were a few aquariums as well, housing sea-creatures and turtles. I saw a group of youngsters squealing in delight as they threw handfuls of nuts (or popcorns?) into a small pond. Loud splashes ensued and I found myself looking at a shoal of brightly colored Japanese Koi fish, jostling for the food. Some of them were really huge! Suddenly, big drops of rain started to fall intermittently, and I ran for cover towards the door that showed exit. But exit it was not. The door actually led to another section of the park –the rooms where various insects and arachnids were on display, right from giant beetles to hairy tarantulas! 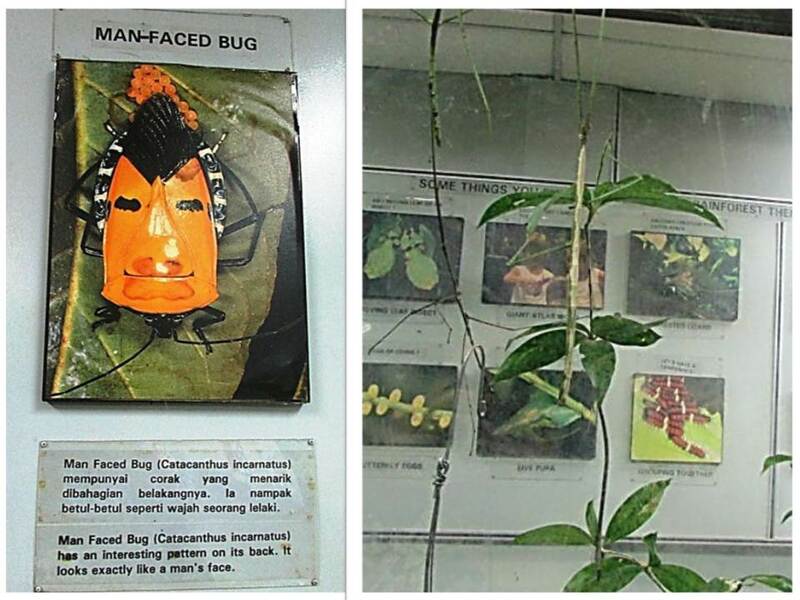 I am ashamed to say but I am quite paranoid about such creatures and I nearly ran past those glass boxes where beetles, grasshoppers and spiders were kept, throwing cursory glances at them. But I stopped at the cases displaying iridescent, jewel-like butterflies – such creations of nature! I resolved to learn more about butterflies and maybe it is time to take up butterfly-watching as well, apart from bird-watching. As I exited the butterfly park, I passed through a souvenir shop selling various butterfly themed paraphernalia, ranging from fridge magnets to T-shirts. But the prices seemed a bit steep to me and I resisted buying anything. The rains had dwindled by then to a slight drizzle and I decided to make my way towards my next destination – the bird park. I will take a break here and continue with my KL series soon. Hopefully that won’t be too long! Lovely collection of pics. Congratulations for winning the contest Sangeeta.